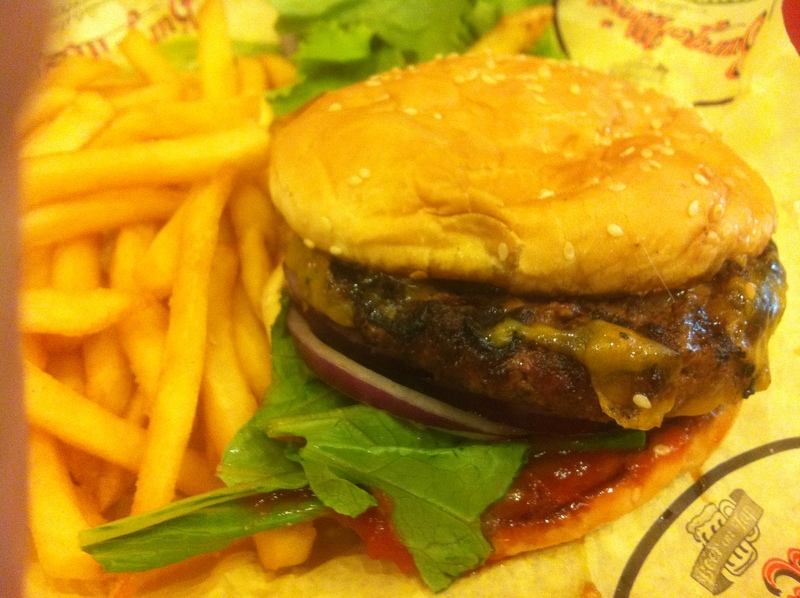 Burger Meister has long been touted as one of, if not the best burger places in the Bay Area. In my earlier years, it definitely ranked near the top, but I didn’t really see it as THE best. So what feels like a lifetime later, it was time to give it another try. So if you’ll indulge my tangent a bit more, I used to frequent the North Beach (SF) location back in high school on Friday nights, but stopped going after we were once turned away over half an hour before closing time. The prices were expensive enough for 17 year olds, but being turned away was just silly. Just turn the damn grill back on. Anyway, the Berkeley location appears to be the first Burger Meister franchise location as per the company website, and maybe that’s a good thing because the vibe is so much better here. The cashiers are friendly, and the food is served promptly. And remember kids, this review is solely based on the Berkeley location. So yes, at Burger Meister, you order at the counter. The options are pretty run of the mill, and the prices add up fast. I personally don’t want to spent $13.00 on a order-at-the-counter burger, so I tend to stick with a straight up cheeseburger, which runs you about $11 after tax. That was always my issue in SF, and my net worth hasn’t changed since I was 17, so yeah, easy decision. But for all of the hype BM gets, shouldn’t the classic cheeseburger do the job? If cow location is your thing (you know who you are, Portlandia fans), Burger Meister uses Niman Ranch beef, which probably adds to the priciness of the place. But though I probably don’t know Niman Ranch beef from Harris Ranch beef (hey, read the about me page again, incase you forgot), I’m happy to report that the meat shines through. There is a lot of juicy flavor packed into each thick patty, and there is consistently a really nice sear. They also don’t hold back on the cheese – a nice slice of thick cheddar melted all over the burger compliments it so nicely. The old fat on fat pairing, music to my arteries. My only complaint with the burger was that it was clearly overcooked. I ordered it medium, and it came out mid well. A friend said his burger was a bit on the rare side after ordering mid-rare. But even though my burger was overcooked, I left thinking this was really tasty, so I guess they did everything else right. There’s just something really tasty about a Burger Meister cheeseburger. But this is something to be wary of – they don’t always get the temperature right. Between the 7 of us, the freshness of the french fries varied. Some of us got the end of one batch, the others got the beginning of a new one. The fries from the new batch were delicious (I stole a bunch from Noah) – mine were a bit cold, but still tasty. The portions are a bit small for what I would expect, but some of my burger-nomming compadres had some leftover fries, so I sated myself with those. I’ve never had a shake here, and I don’t know anyone who has (already overpaying, I think). But I’m pretty sure the Berkeley location has some decent beers on tap, though. I know it varies by location. I may review the North Beach location in the future, to see if they are still as pretentious as they were before – total experience killer. Good thing the Berkeley location is down-to-earth though because I’m near here a lot, and it’s definitely a solid option. So is Burger Meister worth going to? In general the most hyped places are worth a try, because your results may vary. I’ve always liked getting my own opinion. And in this case, my opinion is that Burger Meister is not the best burger in the Bay. That said, if you don’t come in with skewed expectations, you will not be disappointed. Do give it a try. this looks amazing – i have to try it next time i’m in berkeley!